Ticket cost is $25-$30 for adults; purchased in advance. Tickets are on sale now at www.lincolntheater.com (May 6th concert), www.nvoh.org (May 20th concert) or at www.VOENA.org. Additional information can be found at www.VOENA.org. 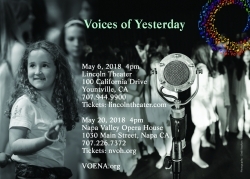 VOENA is an award-winning children’s a capella singing group, serving over 100 children ages 6 to 18 at two regional chapters in Benicia and Santa Rosa. Director, Annabelle Marie inspires children to celebrate music through voice, sound, rhythm, and physical expression. Singing in over 25 languages, VOENA has performed around the globe inspiring audiences at the 2012 London Olympics, the Grand Ole Opry, as repeat guests at the White House, for Pope John Paul II at the Vatican in Rome, and as goodwill ambassadors to Bali, Italy, Ireland, China, and Japan. VOENA was the first American Choir to sing at the Soweto Festival in South Africa. VOENA will be heading to Carnegie Hall in April 2018 to perform at the Magnificent Isaac Stern auditorium under the direction of Grammy winner, composer and conductor Eric Whitacre, spreading their mission to unite the world and empower future leaders through music.